Most of the Christian churches I pass whenever I leave my home have electronic reader boards out front near their signs. I suppose this makes it far easier for them to change the text they want to display to passersby. Some of the more sophisticated setups probably even let them program their content in advance, which would certainly be nice for them. Maybe they could decide each Sunday what they'd like to announce and set it up to run unattended throughout the week. For the most part, these local churches use their electronic signs to do just what you'd probably expect. They advertise the times of their services, announce upcoming events, and threaten people with hell. If that last one surprises you, remember that I live in an area where evangelical fundamentalist Christianity is the norm and not some fringe oddity. The evangelical fundamentalist Christians around here don't tend to go for the "Jesus is love" stuff nearly as much as the sort of liberal Christianity in which I was raised. Their Jesus is only fond of those who believe as they do. Anyway, I saw something a bit different this morning. One of the many churches along my route had the following on their electronic reader board and nothing else: "I am come." Believe me, I started at it for quite awhile to see if this odd message would be followed by anything else. It wasn't. That was it. That was the entirety of what this church wanted to communicate to those of us driving by. From what I recall, the grammatically grating "I am come" language is found primarily in the King James version of the bible some Christians claim is "holy" and is typically replaced with the more appropriate "I have come" in some other versions. And yet, the phrase is typically followed with something besides a period. That is, the Jesus character typically goes on to complete a thought. 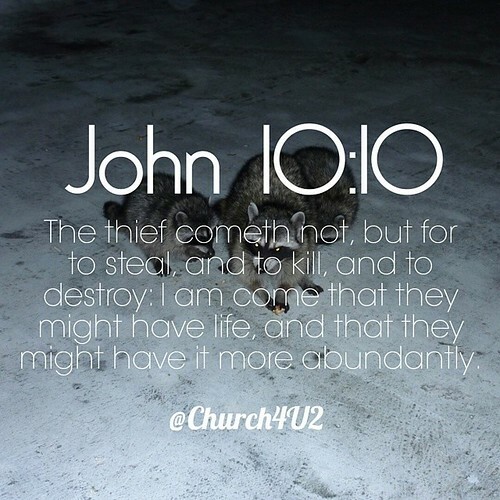 The above passage from John 10:10 is an example. Maybe this particular church figured that everyone driving by would be so familiar with this passage that they didn't need to complete the sentence and we'd all know what they were trying to say. Based on how few Christians have bothered to read their bible, this struck me as unwise. Had that been their intent, it would have been smart to at least follow their three-word phrase with "John 10:10" or whichever other passage they had in mind. It would have fit easily. But no, they figured they'd rather give any 14-year-old boys a laugh and inspire an atheist blogger who happened to be driving by.